The Seattle Seahawks, who had allowed an NFL-worst 31 sacks entering the game, didn’t allow any in a 13-12 victory over Dallas on Sunday. But it’s not perfect, just better. RENTON — The good news is that Seahawks guard J.R. Sweezy said he thinks the offensive line just played its best game of the season. The sobering news is that Seattle’s problems along the line aren’t entirely fixed after a 13-12 victory against Dallas. The Seahawks were the worst in the NFL with 31 sacks allowed entering Sunday. But in Dallas, the Seahawks didn’t allow a sack for the first time since the Super Bowl two seasons ago, and quarterback Russell Wilson often had time to stay in the pocket, scan the field and throw. Wilson wasn’t always sharp, but he often got rid of the ball in rhythm, quickly, which always helps the line. It was not perfect, just better. Alvin Bailey played a solid game filling in for injured starter Russell Okung at left tackle, but he missed a cut block on Cowboys defensive end Greg Hardy that led directly to a costly interception. 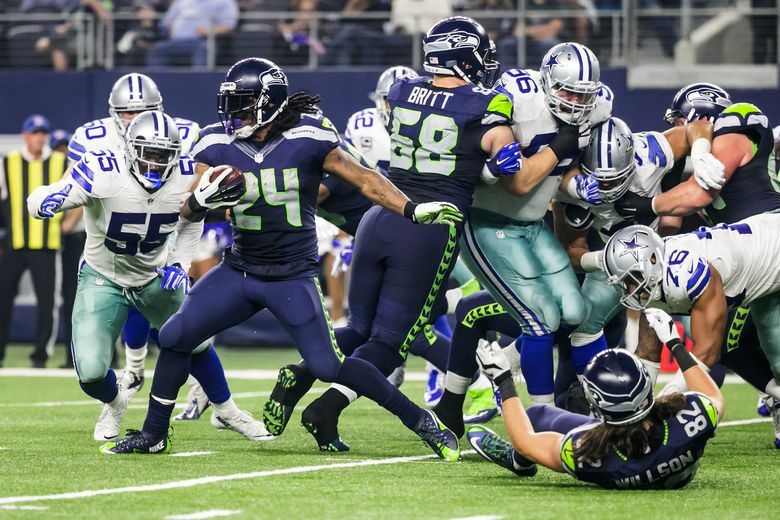 Running back Marshawn Lynch gained just 3.4 yards per carry, the fourth time he has averaged less than 3.5 yards. And the Seahawks still are the worst team in the NFL at scoring touchdowns in the red zone. They settled for field goals on both of their trips against Dallas, including their final drive to take the lead. They are now scoring touchdowns on a league-worst 29 percent of their visits inside the 20-yard line. Their lone touchdown Sunday came from 2 yards outside of the red zone. Carroll heaped specific praise on Sweezy and Justin Britt, Seattle’s starting guards who have struggled this season. Carroll thought both played their most consistent and poised game of the season, particularly when the Seahawks passed. Pro Football Focus gave Britt and Sweezy positive grades in pass protection, an area where they’ve struggled. The offensive line allowed only six quarterback hurries, although Pro Football Focus notes the Cowboys blitzed just 9 percent of the time. It wasn’t perfect against the Cowboys, just better.